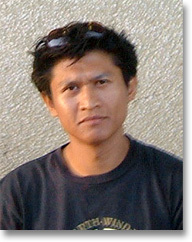 Razif Bahari is a poet and scholar who writes in English and Malay. He was born in Singapore and educated at the National University of Singapore, Murdoch University, and the Australian National University. Much of his work is concerned with examining and questioning Malay identity in the multicultural context of contemporary Singapore. His book Pramoedya Postcolonially (2007) investigates the construction of the nation, history and identity in the novels of Indonesia’s best-known novelist, Pramoedya Ananta Toer. Razif Bahari’s poems have appeared in Singa, The Straits Times, Berita Minggu and other journals, and he is currently preparing his first collection, while working on a book examining the role of poetry in shaping and conditioning conceptions of Malay identity, community and nationality, entitled The Sublime Object of Liminality: Mapping Spaces for Counter-Discourse in Malay Poetry. He is chief editor of E-Utama: Journal of Malay Culture, Language and Literature, and he teaches modern Malay and Indonesian literature at the Nanyang Technological University, Singapore.